It’s been a little over a week since “the incident” but summer squash and I have made up! Finally, I feel like bringing some of that yellow goodness back into my kitchen. This time though, I decided to leave the mandolin in it’s box….that was the real trouble maker anyway! I just used my chef’s knife. Things turned out great. 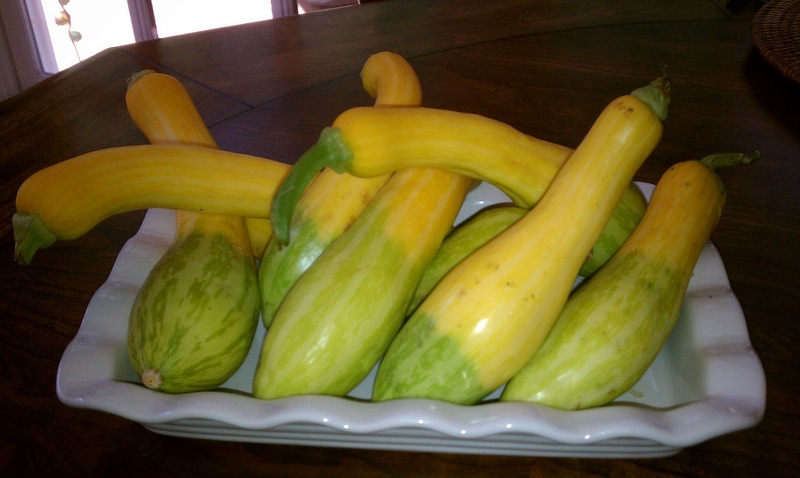 I have always been a lover of summer squash. Whether stewed, fried, grilled, stuffed or in a casserole, I am a FAN! My guy, Hunter and I eat sauteed squash with onion about once a week – the two other dudes…not diggin’ it. Their loss. So, today I decided to treat Hunter to a surprise – squash casserole. If you are a Southerner, or have lived here for any amount of time, you know this is a “regular” at the dinner table, covered dish or church event in the summer. If you are not from here and have never tried this creamy goodness, well, just come on over – I’ll make the introductions! 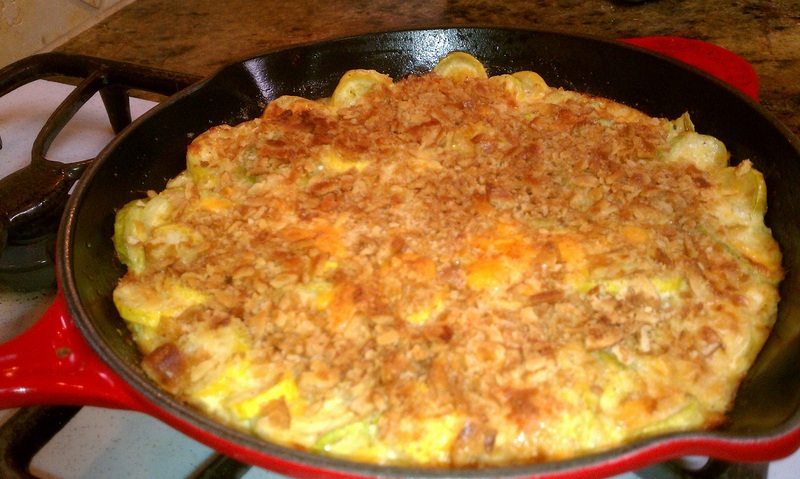 For this casserole, I changed it up just a little bit due to ingredients that I had on hand. I think it turned out better than ever. 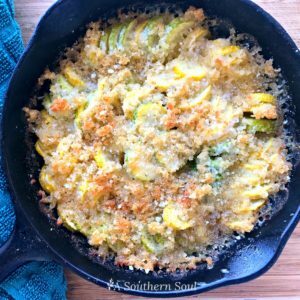 I also cooked mine in a cast iron skillet just because I like for the edges to get a little crunchy….if taking to an event, I’d put it into a casserole dish. Hope you’ll try it…let’s get cooking…. 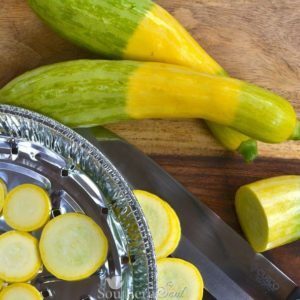 Casserole is a classic dish, and fresh squash makes it shine. Saute the squash and onion in butter with salt and pepper until tender. Coat the bottom of casserole dish or cast iron with butter. Mix in the cheese, sour cream and milk. Gently fold in the squash and onion mixture. Top with the cracker/pretzel crumbs and dot with butter. Bake at 375 degrees for approximately 20 minutes or until golden brown on top. Most of the squash recipes I’ve had are topped with a great cracker topping. Well, I only had enough crackers to barely top my dish so I decided to go with what I had on hand – pretzels. I loved the outcome and so did Hunter! Great crunch with a little saltiness, so I’m keeping this one. Lesson learned, use what you have, be creative…..you just never know if this will be the change that last forever. Favorite summer vegetable?? That is a hard pick but I voted for corn…love it buttered and salted. I know what we'll be having for dinner tonight!